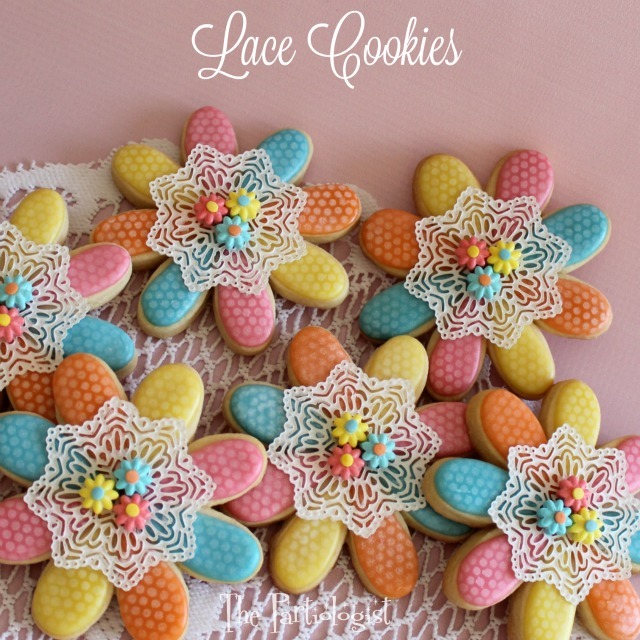 The Partiologist: Pretty Lace Cookies! What you're about to see is what I call the prettiest cookies I've made...at least in my opinion. 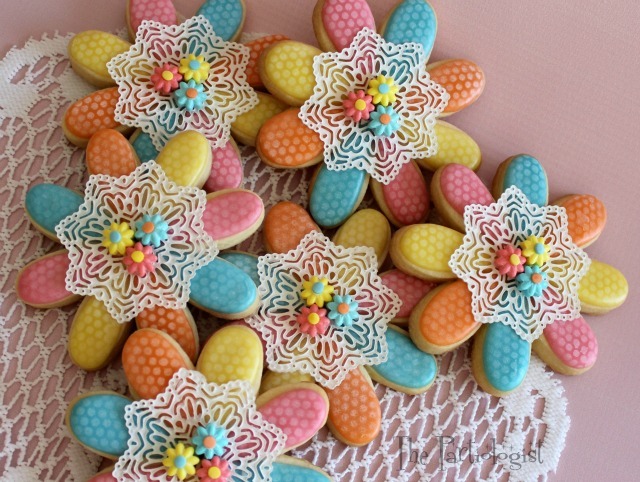 Staying with the theme of Shabby Chic, I didn't want the cookies to look too vintage, just fun and lacy. Cake Lace...you know it's my new love, don't you? If you stick around long enough, I'm sure you'll be seeing more cake lace popping up on my edible creations. These are my favorite. Oh, I think I told you that already. How would you like to add these cookies to your collection? 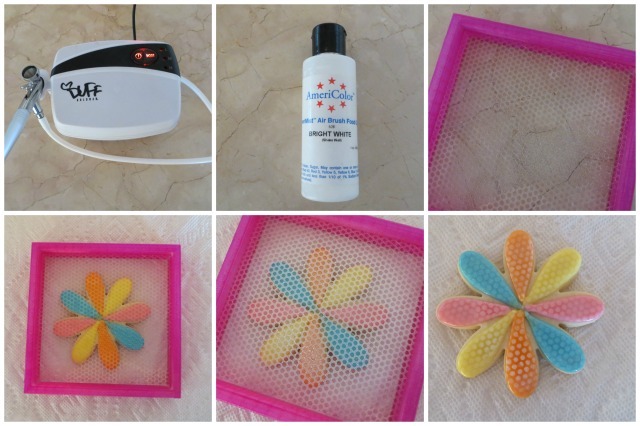 Let me show you how easy it is to use cake lace. 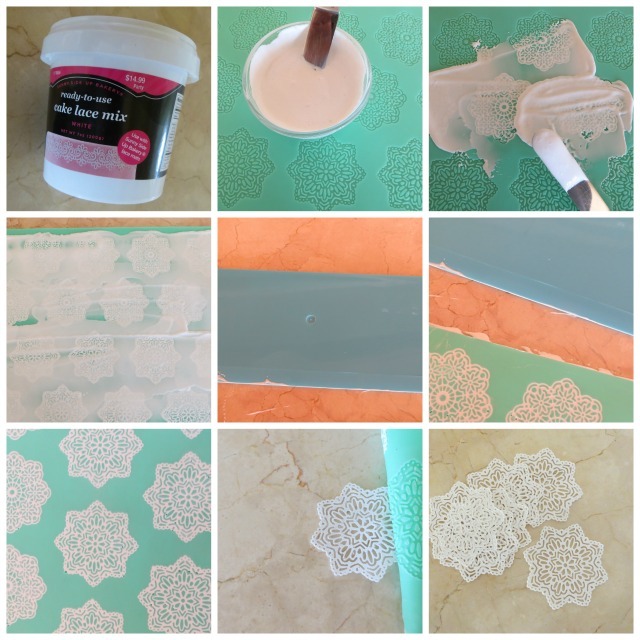 Truthfully, I have so many cake lace mats waiting to be used, I'm thrilled to start using them ALL! With a little practice (maybe a lot of practice) I think I have the hang of it. I found the cake lace mix at Hobby Lobby and it works like a charm! Mix according to the directions and spread a thin layer across the mat. Once the mat is covered, use a large cake lace spreading knife or large off set spatula and remove the excess. Once it is dry, carefully, turn the mat over and peel the mat from the lace. Keep your little lace doilies in a zip lock bag until needed. Now it's on to the cookies. Start by baking your favorite sugar cookie recipe that doesn't spread. Mix up four colors of royal icing. I like to use tipless bags, just cut off the tip and you're ready to go. 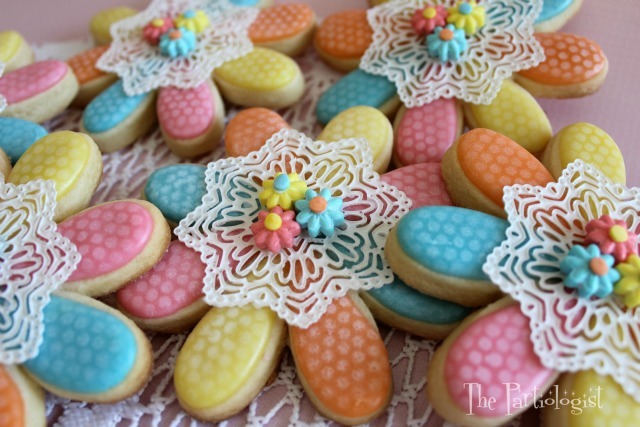 Add a color to each petal, using two of the same colors on each cookie. After the cookies are filled with the icing, set aside to dry. Now for another fun part of making the cookies. Getting to use my Airbrush! It's another gadget I left in the box for way too long, worrying I wouldn't know how to use it. Fill the tiny cup with white airbrush food color. I used a 6 x 6 mini dot stencil for the cookies. The pink frame holds the stencil with four magnets in each corner. Place the stencil over the cookie and spray with the white airbrush color. Now each petal will have tiny white polka dots. Now on to more fun decorating. Can you stand all the fun? I have little candy flowers and sprinkles I thought would look cute on the cookie. 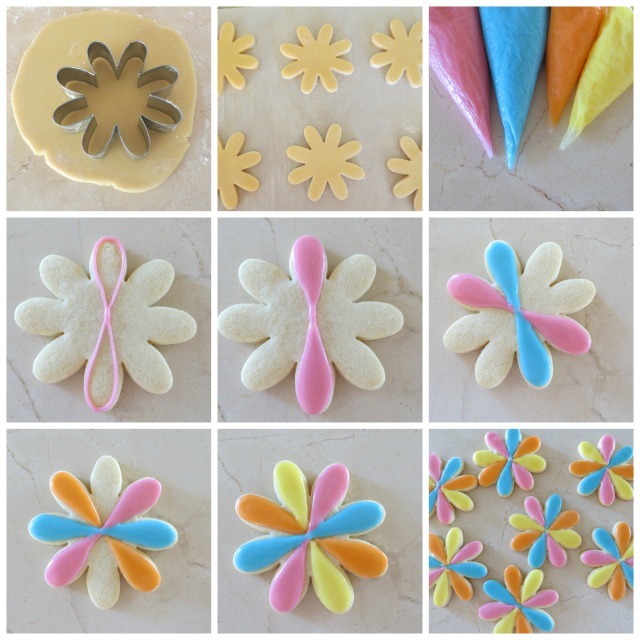 Spread a tiny bit of Karo syrup in the center of the flower cookie. Add the lace doily to the syrup. Pipe three white dots of royal icing to the center of the doily. Add the three candy flowers. Pipe a tiny white dot in the center of each flower and add the sprinkle. So tell me, are you in love? You are a genius Kim. They are so pretty. Well, I don't really know if I'm a genius, but I like the thought! LOL Thanks Amanda! I love all the techniques you used to create these pretty cookies. What does the cake lace taste like? Would you eat it with the cookie or peel it off? Thank you Beth, unfortunately I don't like the taste of Cake Lace and I would definitely peel it off! I even tried adding flavoring and it did not help. Maybe someday there will be a new and improved version, fingers crossed! Kim these cookies are just beautiful! Kim, these cookies are gorgeous!!! Can you tell me what is the consistency of the dried lace. Is it flexible, stiff, rubbery? Does it easily tear or crumble? When you apply it to your mat do you want to spread it a certain thickness? so many techniques in one cookie! I really want to try the lace. Thanks for sharing your post with http://tryit-likeit.com/link-party-it. You've been pinned to our Link party board too! Thank you for the link party invitation! 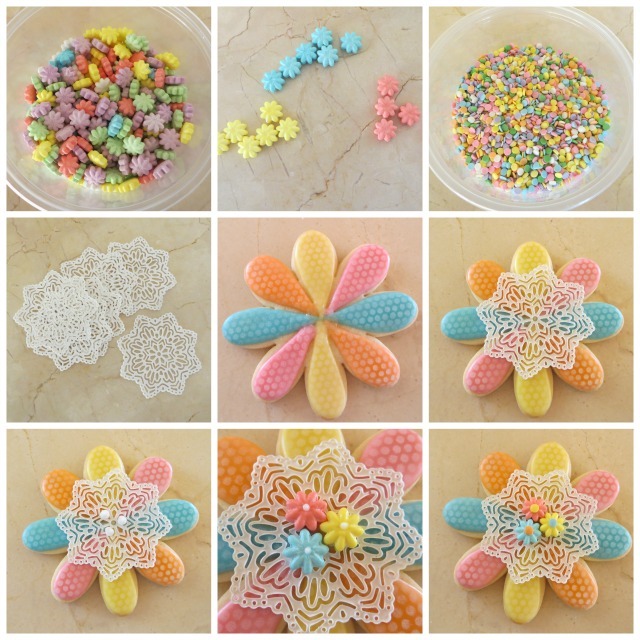 I do hope you try out the cake lace, it's fun! These are amazing! I'm lucky if the frosting stays ON my cookies let alone looks that awesome. Wow! The key to get the icing to stay on the cookie is the consistency. With a lot of practice, I finally figured out how to make it not too thick or too thin. Thanks for the comment! Maybe they are not the easiest ones but these cookies are super cute! !